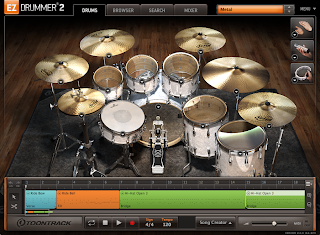 Toontrack's newbie EZdrummer 2 has been looming large in the music-tech media for more than a month now, but then we did get our fingers on this latest incarnation of the Swedish dev’s leading, nay legendary, percussion suite in March. And has it ever encouraged a fest of finger-to-keyboard since. Such pre-launch prestidigitation is a relatively common phenomenon known as 'Toontrack offers pre-release copies to the media on the understanding that reviews will appear at launch'. It certainly freshens the blood of tech journos as we clamber over each other trying to deliver a product review first. Of course, the benefit of holding back from publication means one can to assess what it is that others have digested which, as it turns out, appears a satisfying concoction of meaty, beaty, skin-on plug-in (and yes, it’ll run stand-alone in the gratis Toontrack Solo). 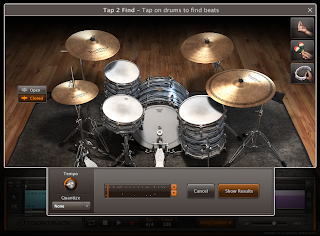 OK, so some organs popped their corks readily, with such pronouncements as: "...EZdrummer 2 defines the next generation of virtual drumming software that many will seek to emulate," from Music Tech magazine. And from Sound On Sound editor Paul White, the apposite: "All in all, the affordability of EZdrummer 2 and its spectacularly 'real' sound quality make it a remarkably effective alternative to miking up a real drumkit." Apposite because he hints at what EZd2 is not, which we'll come to in a bit. First, having bagged this baby and thoroughly chewed it, FellKlang is honour-bound to deliver the kind of quotable summary that marketing types like to emblazon on product promo. 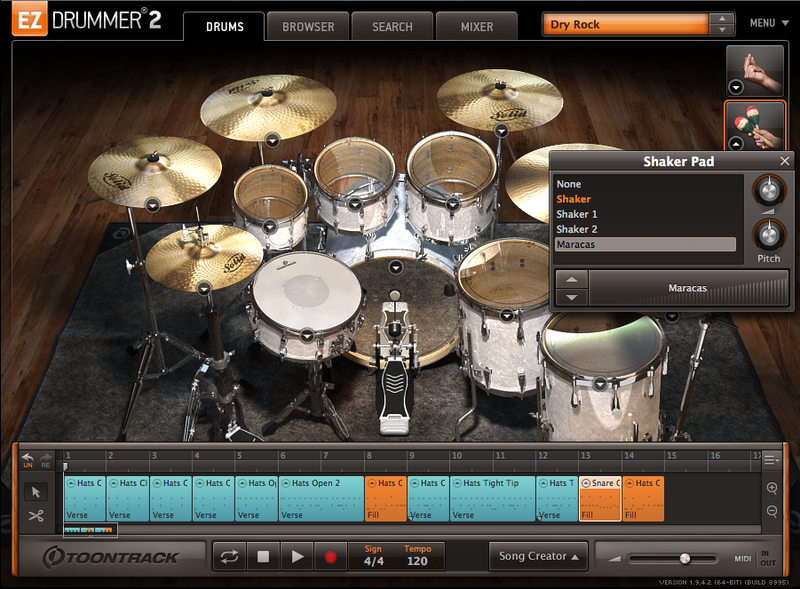 Olé: "Newcomers to EZdrummer will be gobsmacked by the awesome vitals of this freshly refreshed groove tool, while those existing users who decline to upgrade to v2 should be taken out and shot." That should do it. Truth be known, the aforementioned organs, along with SonicScoop, Audiofanzine, Pro Tools Expert and more, have judged that EZdrummer 2 is a bloody brilliant buy if you're aiming to emulate realistic percussion performances. Aye, there's the nub. 'Realistic', as alludiated, is where EZd2 is very much at, along with the organic process of writing music with feeling, changing mood and (for the love of Christ!) musicality. What it's not so good for is the copy/paste hack of stringing together the metronomic pulse patterns that feature in much electronic dance music. 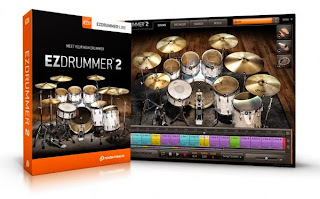 Sure, there are expansion packs such as Number 1 Hits EZX and Electronic EZX, laden with synthetic blips and plops, but the bulk of Toontrack's EZX collection, all of which has been updated to integrate brilliantly with EZd2, is geared towards natural drum performances, rather than providing click-tracks for the free-form seizure of amateur club/festival dancers. For the latter, you'd do better with a step sequencer, such as a drum machine emulation (maybe even a fashionable hardware type), or the loop library from an EDM 'construction kit'. That’s right, some folk don’t have flights of fancy; they have Meccano. While we’re on expansion, the new Vintage and Modern kits bundled are very super. Toontrack has plenty of experience sampling percussion pieces and presenting them as cohesive ensembles. If it helps to know, the Vintage kit was captured via a rare REDD mixing desk, while takes for the Modern kit passed through Neve 88R and TG12345 consoles, all with dollops of old and new outboard, housed at Mark Knopfler’s well-appointed British Grove Studios. 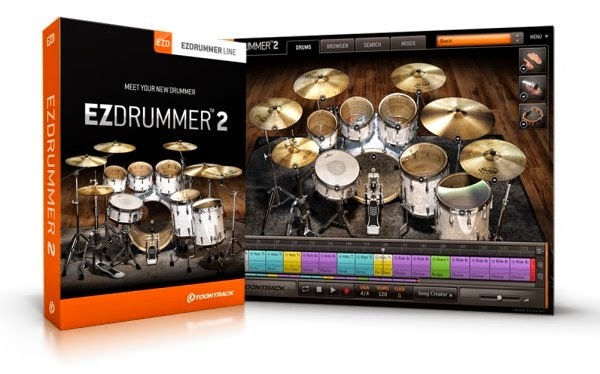 There’s plenty more video to be had via Toontrack’s YouTube channel, should the above leave any doubt as to the flavour of EZdrummer 2’s beat soup. A key highlight for many will be the means to hoik certain instruments out of various EZXs and incorporate them into whichever expansion is loaded, the config of which can be saved as a project. Others may lust for the tweakable effects that load in the Mixer window when a preset is called, although there’s a lot more that could be done with this new function. The Mixer is still a fairly basic affair, lacking many of the routing options hosted by software mixers that you’d find in DAWs, for example. And while effects can be adjusted, their configuration and routing cannot. 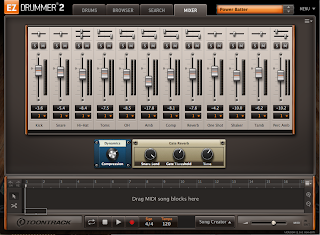 Of course, it could be argued that if more control is necessary, you should create an instance of EZdrummer 2 with multiple audio outs and use the DAW’s mixer and your own processing plugs, or look at Superior Drummer instead. And that leads us to speculation about what Toontrack has in mind for SD3, now that EZd has new boots. There’s no word as yet, but we’re talking about a developer not known for resting on its laurels. 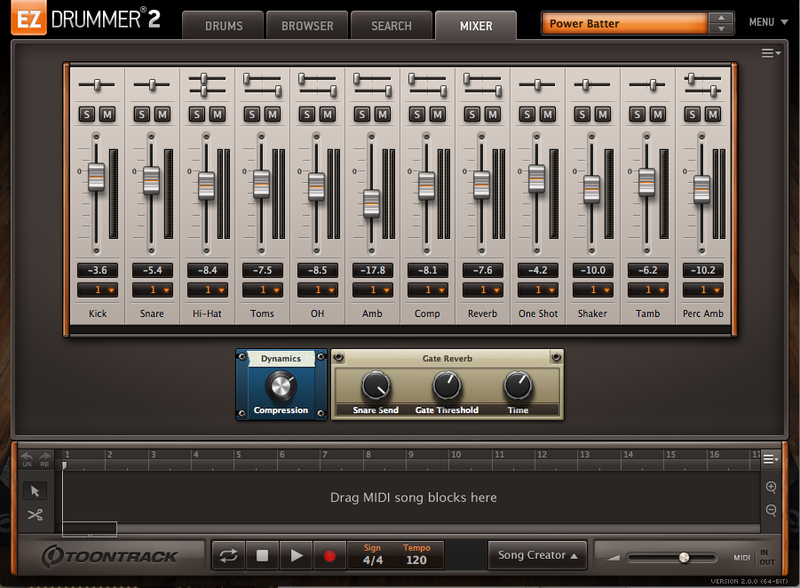 For now, what Toontrack has done is to redefine what makes EZdrummer such a great tool for songwriters. Some folk plink away at new material on a keyboard; others plonk a guitar, and it’s really handy to have a flexible, easily programmable percussion instrument to hand when sketching up a song. EZdrummer 2’s built-in sequencer functions, such as the Song Creator and its Song Structures mapping shown in the above videos, make compiling traditional pieces a cinch. 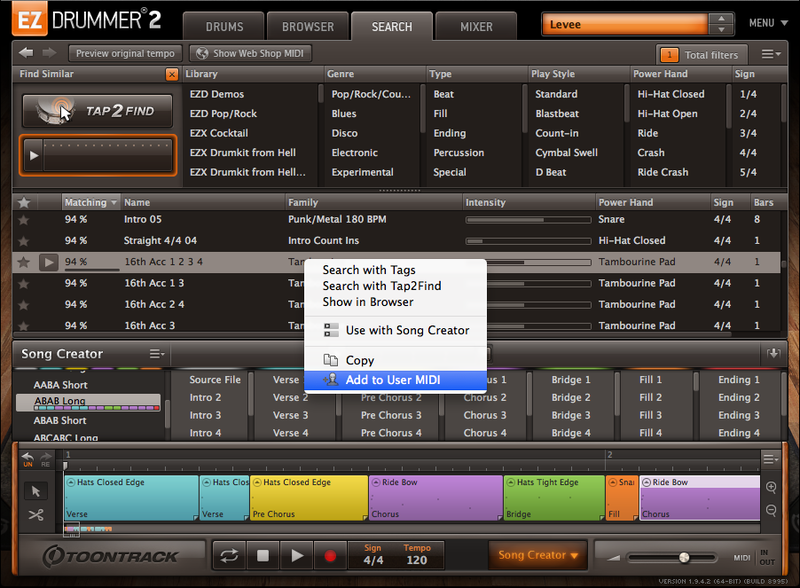 Then there’s Tap2Find under the search tab and the whizzy, seemingly intelligent way in which beat variations can be plucked from multiple Toontrack MIDI packs, which gives you a real edge when whipping up fresh stuff. 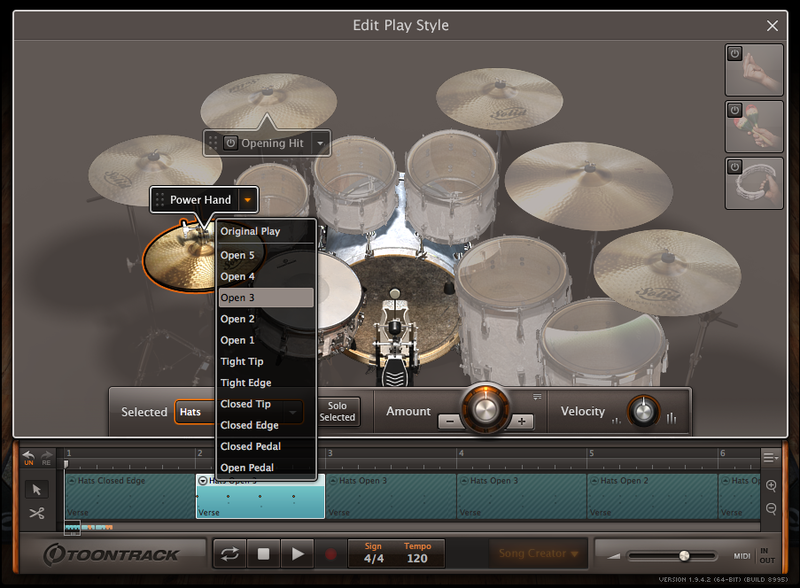 There’s further scope for pattern variation thanks to a new Power Hand feature by which you can change the accent of a particular element in the sequence, such as the hi-hat, snare, kick drum or other, and increase or decrease its influence over a pattern, adjusting note density and velocity. Again, this is demonstrated in video above, which you have watched. Haven't you. This new facility, better experienced than explained, is very effective when aiming to personalise patterns for a production and will save a lot of messing about in the DAW’s MIDI editors. As with piano-suite EZkeys, Toontrack does not merely present well-captured timbres and MIDI performances. The dev also provides powerful songwriting tools to those with the quill and the knack (and we all know how the real money in music is to be made). Overall, EZdrummer 2 is more than an upgrade; it’s a quantum leap forward for those authoring real-sounding percussion performances and penning new material. The seasoned ear can these days recognise a typical version 1 rhythm track created by someone in a hurry - check out rock song demos on SoundCloud for an earful of passable, if non-fluid beats played that little bit too perfectly. EZd2 should bust things up by offering easy access to pattern variations in-keeping with the groove, but from a wider pool of MIDI files. 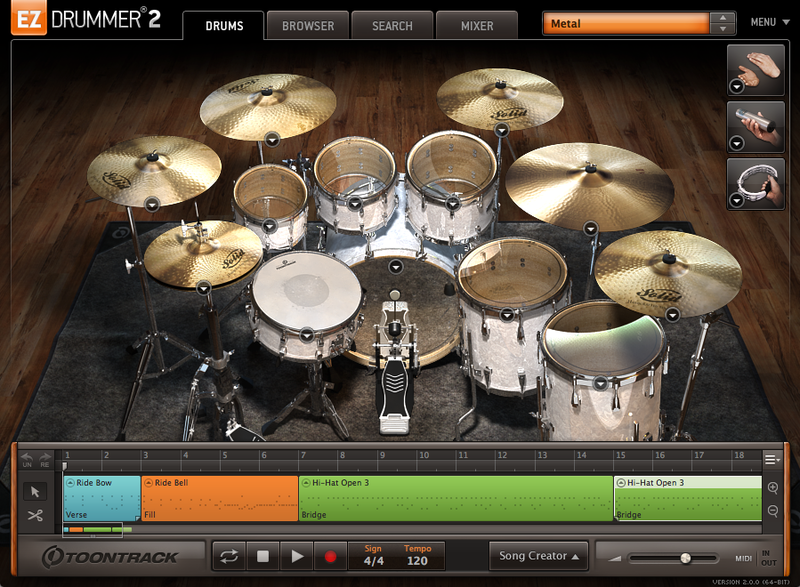 If you already use the original EZdrummer, know that EZd2 is like homo sapien - an evolutionary jump, which can co-exist with its predecessor, but makes for a far better killer. Hit, that is. The price is more than reasonable at £56.95 from Eurodistrib Time+Space if you’re already EZd1-equipped, or a ludicrously low £99 when buying in afresh. With luck, the investment will pay off hand over fist as new songs spring forth, studio time is saved and wetware drummers are made redundant. Possibly. To round off, here’s lobbing the ball into your court with audio demos yanked from Toontrack’s SoundCloud account. They offer a good idea of what the bundled kits provide and which, to these ears at least, are truly top-line percussion samples. 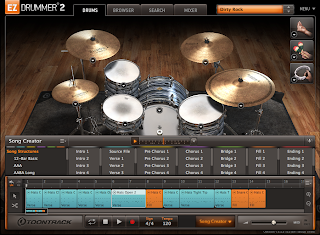 As you will hear, when writing for an audience that may actually be listening, rather than jigging and dogging on a dancefloor, EZdrummer 2 delivers the organic bits that will power your hits to great heights as they’re shared illegally online. If you’re the songwriter, however, at least you'll make some dosh from performance royalties and sync rights. Possibly. I'm here to ensure that FellKlang maintains the highest standards of journalism while delivering information and entertainment without recourse to the words 'advertorial' or 'infotainment'. I'm also a music-tech buff of more than 40 years, a journalist of more than 25 and have been torturing guitars since I was knee-high to an AC10 (not 15, note). I'm a former editor of UK magazine Future Music and devised/launched Total Guitar, still the biggest-selling guitarists' magazine in Europe. If familiar with select issues of Digital Music Maker, Computer Music, Macworld UK, MacFormat, PC Format (heck, Amiga Format, even) and AudioMedia, you'll doubtless have encountered my articles already. My aim is to ensure you get the gen you need to make the most of the gear instrumental in forging that Fell sound, or FellKlang... You'd have to ask the Doktor about the monicker (or see his blog), but his music can be auditioned via these pages' rather trick media players. Happily, however, the tools and techniques engaged in forging FellKlang are deployed in numerous musical genres. So have a good read and lend me your ears so as to maximize musical muscle. © Karl Foster 2010+. Awesome Inc. theme. Powered by Blogger.